J&D Manufacturing has taken the popular Twin Beam Suspended Freestall System and separated the beams into a split rail configuration that allows the rails to be mounted at any height independently. 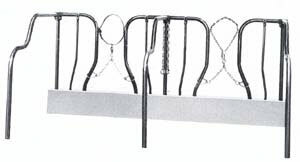 The heavy-gauge, corrosion resistant Split Rail System fits all sizes of our Ironside or Relax Fit loops without requiring specialized loop brackets for different loop heights. Each loop is attached to the rails using 2 of our 2-3/8" or 1.9" universal loop brackets. The J&D split rail system is one of the most flexible and easy to install freestall systems on the market today at an affordable price. J&D Manufacturing's popular Twin Beam Suspended Freestall System is now more flexible than ever before! 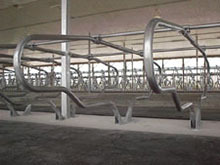 Cow spacing is fully adjustable along the Twin Beam tubes for more cow comfort area. The Twin Beam height is fully adjustable using the new adjustable post and wall mount, and for the first time ever, even the loops are fully adjustable! The Twin Beam System uses J&D's proven Ironside, Relax Fit, and Dog Bone heavy gauge loops. The Adjustable Loop Twin Beam System offers the same features as our standard Twin Beam system, but adds the flexibility of individual loop adjustments. Consider the possibilities of raising or lowering the height of individual rows or sections of stalls throughout your barn to fit your growing herd. With the new galvanized bracket option you can create a fully galvanized system using J&D galvanized twin beams, brackets, mounts, and clamps. 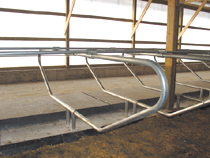 The Adjustable Loop Twin Beam System is available for 2-3/8" loops, and also for 1.9" calf or heifer loops. J&D Manufacturing's Single Post Relax Fit and Ironside Freestall Systems give today's progressive farmer the proven features of our heavy duty loops with the flexibility of our weld-free clamp system. 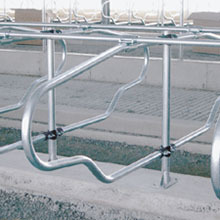 The single row or head-to-head clamp system allows you to easily adjust the height of the loops so your cows can have the comfort they deserve. In today's changing world, why not invest in a freestall system that can change with the needs of the herd? J&D's Post-less Free Stall System requires less hardware, provides increased headroom, and reduces air restrictions and animal injuries. With the benefit of being able to install after cement is poured, and with no concern for post placement, this system allows for easy retrofitting without all the complications and adaptations needed with other systems. J&D Manufacturing's new Poly Brisket Tube System is gentle on your cows. 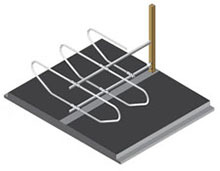 Unlike wood or concrete brisket systems, our poly tube has a round profile to prevent injuries. The adjustable stall mount bracket system moves easily up or down, forward or backward to provide the proper lunge room for various size animals. Berg Free stalls offer superior quality at competitive prices, reduced installation cost and easy stall maintenance. They also aid in improving animal safety. Berg free stalls have a reduced installation cost and are very low maintenance. They also help improve animal safety. The NU-PE is designed to allow for lunges when cows stand. The paralleled ends make for easy installation. 1.9 and 2.3 OD sizes are available. Berg's Arrow Free Stall is designed to fit today's dairy cow in a modern free stall barn. Dairymen are looking for better utilization of their free stalls... and the Berg Arrow Free Stall matches that need! These stalls give your cows easy access with a high neck rail placement. Arrow Free Stalls are sloped down at the rear to let the cow turn her head over the loop for smoother, faster exit from the stall. They also offer a large opening for lunge space and cantilever design for cow comfort. Built with Allied Steel's Agri-Tube 60 galvanized steel for corrosion resistance with Allied's Flow-Coat triple coat protection. Arrow stalls can be used in many mounts or mounting systems including the Berg new surface mount bracket for head-to-head free stall systems. Tie stalls help keep cows cleaner, drier and more comfortable with less bedding. 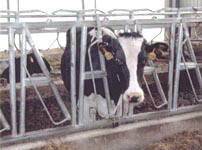 The optional crotch chain automatically changes position to compensate for the position of the cow, regardless of whether the cow is standing, eating chewing, or lying down. This tends to minimize the danger of tripping, tangling or choking. 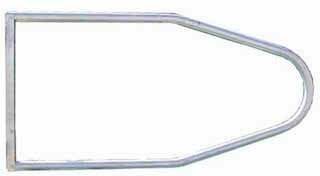 Berg tie stalls are constructed of 10 gauge Gatorshield pipe with an O.D. of 1.660". Polyvinyl sleeves on the arch and partition are standard. Solid shafts in the partitions are included with the price of each stall. Neck straps, neck chains or hook-up chains are optional. Standard stall width is 48 inches. However, we can custom manufacture stall widths to your specifications. Stalls are manufactured from Allied Agri-Tube 60 Gatorshield structural steel tube--providing uniform quality and superior corrosion resistance. 20 YEAR RUST OFF GUARANTEE!! Here is a cow stall that has the comfort and convenience of a luxury line stall and the economy of a tie-stall. 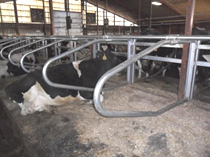 The Head rail can be adjusted forward or backward to meet animal size demands and it can be mounted on top or below the partition rail for additional cow comfort. This stall easily lends itself to pipeline milkers. Here you have comfort, convenience, safety and economy all wrapped up in one stall. Now you can use mattresses in combination with your comfort stalls. Berg one-legged comfort stalls are built like no other on the market. Using 3 X 3 box Gatorshield tubing stall posts, these stalls are stronger that conventional round piping. Berg One-Legged Comfort stalls use 1.9 O.D. Gator tubing for the partition instead of traditional 1.66 O.D. 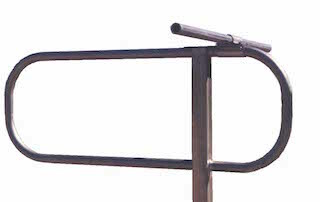 tubing and a heavy-duty Cross Clamp. Prices include stall loop with box tubing, tie up chain and cross clamp. BERG's new Economy One Leg Stall comes standard with 8 inch plastic Rust Shield and a 16 inch solid shaft welded in the pipe entering the cement. The top rail clamp supplied with the stall is for a 1.66" pipe. Suggested curb height is 10". The suggested Stall height is 42" from the stall platform. 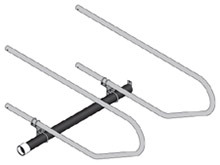 The HLM Series Self Lock Panels are being improved to provide an optional field adjustable neck widths that will allow you to better manage your facilities to your livestock needs. The HLM Cow Panel has a neck width adjustment from 6" to 7.5" at 23" openings and is 40" high. For animals 600 pounds and up. The HLM Calf Panel has a neck width adjustment from 5" to 6" at 19" openings and is 36" high. For animals 200 to 650 pounds. Just what you would expect from the company that has provided top-quality products to the dairy industry for over 80 years! Combining all the best features, applying experience and listening to top producers from across the USA, Berg has developed the ultimate self-locking feed panel. Compare Berg's panels feature-by-feature with all other self-lock panels and you will find out why it is the BEST! 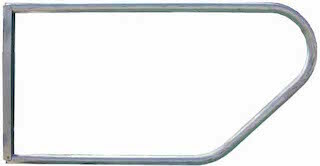 Strong stress free, all-welded frame featuring 1-5/8" o.d. galvanized steel pipe with 60,000 psi yield and 75,000 psi tensile strength. Automatic down cow release on all stanchions. Frame mounted catch assures lock-ups that are always properly adjusted. Individual external cow release provides safety and ease of operation. Slip coupler mounting bracket with swaged pipe ends make mounting simple. 10' Panel length is standard. 8' and 12' lengths are available in most sizes. Choose the spacing to meet your needs from small calf to full size cows. Mounts easily to Berg's 2-7/8" Ga. posts. A unique and sturdy surface mount system designed to maximize lunge space. A better way to mount your free stalls!